CUPERTINO, California—August 24, 2009—Apple® today announced that Mac OS® X v10.6 Snow Leopard™ will go on sale Friday, August 28 at Apple’s retail stores and Apple Authorized Resellers, and that Apple’s online store is now accepting pre-orders. Snow Leopard builds on a decade of OS X innovation and success with hundreds of refinements, new core technologies and out of the box support for Microsoft Exchange. 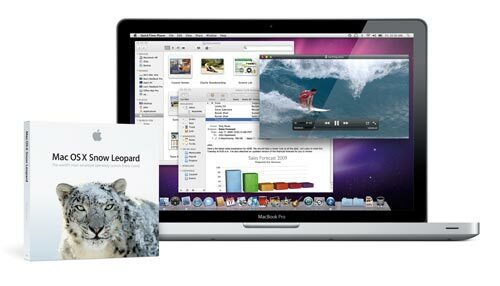 Snow Leopard will be available as an upgrade for Mac OS X Leopard® users for $29. To create Snow Leopard, Apple engineers refined 90 percent of the more than 1,000 projects that make up Mac OS X. Users will notice refinements including a more responsive Finder™; Mail that loads messages up to twice as fast;* Time Machine® with an up to 80 percent faster initial backup;* a Dock with Exposé® integration; QuickTime® X with a redesigned player that allows users to easily view, record, trim and share video; and a 64-bit version of Safari® 4 that is up to 50 percent** faster and resistant to crashes caused by plug-ins. Snow Leopard is half the size of the previous version and frees up to 7GB of drive space once installed. For the first time, system applications including Finder, Mail, iCal®, iChat® and Safari are 64-bit and Snow Leopard’s support for 64-bit processors makes use of large amounts of RAM, increases performance and improves security while remaining compatible with 32-bit applications. Grand Central Dispatch (GCD) provides a revolutionary new way for software developers to write applications that take advantage of multicore processors. OpenCL, a C-based open standard, allows developers to tap the incredible power of the graphics processing unit for tasks that go beyond graphics. Snow Leopard is the only desktop operating system with built in support for Microsoft Exchange Server 2007, and it allows you to use Mac OS X Mail, Address Book and iCal to send and receive email, create and respond to meeting invitations, and search and manage contacts with global address lists. Exchange information works seamlessly within Snow Leopard so users can also take advantage of OS X only features such as fast Spotlight® searches and Quick Look previews. Mac OS X Server Snow Leopard, the next major release of the world’s easiest to use server operating system, will also go on sale Friday, August 28. Snow Leopard Server includes innovative new features such as Podcast Producer 2 and Mobile Access Server and is priced more affordably than ever at $499 with unlimited client licenses. More information and full system requirements for Snow Leopard Server can be found at www.apple.com/server/macosx/. Mac OS X version 10.6 Snow Leopard will be available as an upgrade to Mac OS X version 10.5 Leopard on August 28 at Apple’s retail stores and through Apple Authorized Resellers, and online pre-orders can be made through Apple’s online store (www.apple.com) starting today. The Snow Leopard single user license will be available for a suggested retail price of $29 (US) and the Snow Leopard Family Pack, a single household, five-user license, will be available for a suggested price of $49 (US). For Tiger® users with an Intel-based Mac®, the Mac Box Set includes Mac OS X Snow Leopard, iLife® ’09 and iWork® ’09 and will be available for a suggested price of $169 (US) and a Family Pack is available for a suggested price of $229 (US). The Mac OS X Snow Leopard Up-to-Date upgrade package is available to all customers who purchased a qualifying new Mac system from Apple or an Apple Authorized Reseller between June 8, 2009 and the end of the program on December 26, 2009, for a product plus shipping and handling fee of $9.95 (US). Users must request their Up-to-Date upgrade within 90 days of purchase or by December 26, 2009, whichever comes first. For more information please visit www.apple.com/macosx/uptodate. Snow Leopard requires a minimum of 1GB of RAM and is designed to run on any Mac computer with an Intel processor. Full system requirements can be found at www.apple.com/macosx/specs.html. *Testing conducted by Apple in August 2009 comparing prerelease Mac OS X v10.6 Snow Leopard with shipping Mac OS X v10.5.8 Leopard on a shipping 2.0 GHz MacBook® system and a shipping 2.66 GHz iMac® system, both configured with 2GB of RAM. Performance will vary based on system configuration, network, file sizes, data sets and other factors.